Mrs. Ruth Kent doesn’t want to be alone. Her daughter Molly is happily married with a family of her own, and Ruth longs to have someone with whom to spend the rest of her days. She suffers from low self-esteem because she knows she’s getting on in years now and she’s not a pretty young thing like many of the unmarried ladies in town. When the dashing and sweet Mr. George Banks holds a door open for her, he inadvertently opens the door for so many other wonderful things in her life. When it’s revealed through rumors that Mr. Banks may have a checkered past and may not be as kind as she originally thought, Ruth begins not only to distrust him but also herself and her ability to tell a friend from a foe. Mr. Banks refuses to be ignored however and she soon realizes that perhaps she shouldn’t have been so quick to judge him based on a few stories from his past. 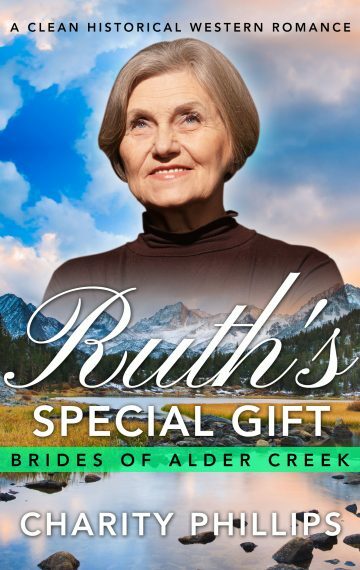 Ruth’s Special Gift is a standalone 20,000 word clean historical Western romance.